The 10 storey height of the Home Insurance Building in Chicago, the world’s first skyscraper built in 1884-1885, pales in comparison to today’s modern mammoth high-rises, but it was a ground-breaking construction that would quickly be repeated and improved upon. Nowadays, high-rises are widespread with major cities depending on them to house the world’s growing population on earth’s limited land. But all those towering structures come with a price; one which the environment is paying. From greenhouse gas emissions to waste disposal, construction is high on the list of industries impacting the environment – in the top 10 according to a U.S. Environmental Protection Agency report. While the need for construction will likely never waver, the need for a more environmentally-friendly industry moving forward is essential. Enter wood construction. While wood is far from a new building material, the ability to create high-rise buildings out of lumber is still fairly innovative, but one that can help change the construction industry for the betterment of the environment. “Wood is a renewable resource, offers flexibility in use, and is a more sustainable building material than concrete or steel in that it sequesters carbon, while the production of concrete and steel releases significant amounts of carbon. Also, a prefabricated wood structure is quick to erect and will result in a cleaner job site and a reduction of construction-related noise,” says John Metras, interim associate vice-president of resources and operations and managing director of infrastructure development for the University of British Columbia (UBC). Laying the foundation for this industry advancement, UBC announced it will be breaking ground on a new student residence made primarily of wood. Once erected, Brock Commons is set to be Canada’s tallest wooden building at 18-storeys, as well as one of the tallest in the world. This pioneering facility will be created with Douglas Fir Glulam and Parallel Strand Lumber (PSL) columns and SPF (spruce-pine-fir) Cross Laminated Timber (CLT) panels. 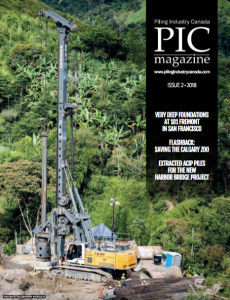 A total of four 64-millimetre double-corrosion protected soil anchors with 1250kN tension capacity will be used on the south side of each core footing. As the wooden structure will be lighter than concrete, the seismic loads are smaller, which impacts the core footing sizes. The foundation, as well as the elevator and stairwell cores, will be constructed with concrete. The core foundations are designed as capacity protected foundations with soil anchors to prevent overturning where required. 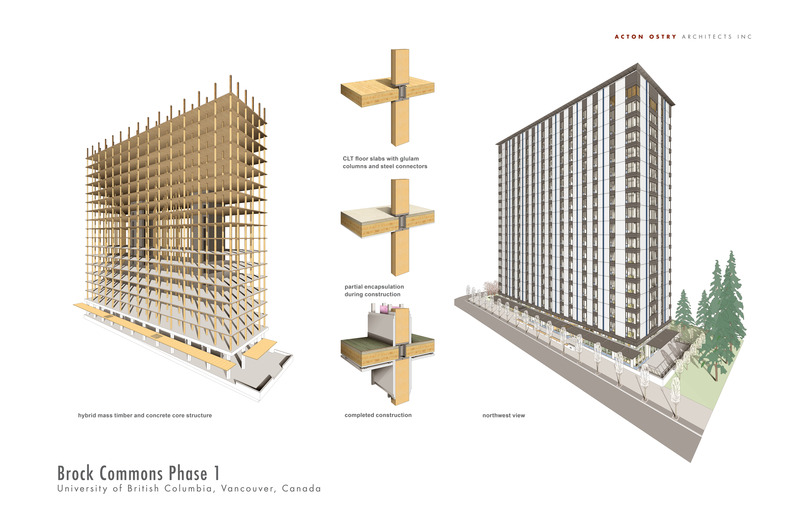 Metras explains that the reason for use of mass timber as the primary structural material stems from UBC’s desire to demonstrate the practical use of a sustainable, locally-relevant construction material in a high-rise building application. “UBC has constructed a number of two to five-storey buildings over the past five years utilizing mass timber structures. This project represents the next step in the evolution of mass timber construction,” says Bernhard Gafner of Fast + Epp, structural engineer of Brock Commons. While provincial regulations only allow for wooden buildings of six storeys or less, the Government of British Columbia issued a site specific regulation to allow UBC to construct with mass timber beyond the current building code limits. The significant height of the wooden facility required that several structural design needs be addressed. Naturally when working with timber, shrinkage was considered. “Providing column-to-column detail relying on end grain to end grain load transfer only is crucial. By avoiding timber members loaded perpendicular to grain, the vertical shrinkage of the wood structure is almost eliminated,” says Gafner. Another concern was the structural robustness and disproportionate collapse. While this issue is of utmost importance in some international codes, the Canadian building codes are vague and general. Given the innovative structure, the design team used the Eurocode EN-1991 as well as the Practical Guide to Structural Robustness and Disproprotionate Collapse in Buildings as expert reference documentation. Finally, the axial column shortening, present in all structures regardless of materials used, needed to be considered and quantified in order to be addressed by the Mechanical Electrical Plumbing (MEP) consultants to avoid potential long-term serviceability issues. “UBC is comfortable moving forward with development of this unique building given the careful design process and rigorous design review by the Provincial Building & Safety Standards Branch, including review by a panel of independent building experts, to ensure that the facility will be safe, functional and sustainable,” says Metras. The student residence will also be the province’s first building to be specified to the new 2015 National Building Code of Canada (NBCC) for seismic design. This resulted in higher seismic loads compared to the 2012 British Columbia Building Code due to the increased spectral response accelerations (Sa), explains Gafner. “The use of the 2015 NBCC did not directly address or change the design of the wood components of the building, but as a result of the higher seismic forces, the CLT diaphragm needed to be designed to withstand these increased seismic loads,” says Gafner. The building’s safety measures will include enhanced fire protections and backup systems, a building-monitoring system, and an upgraded building core. While the Brock Commons student residence will primarily function as living quarters for 400 students, once construction is completed in the summer of 2017, the building will also provide a unique learning opportunity. As part of the UBC Campus as a Living Laboratory initiative, students and faculty will research the design, construction, evaluation and monitoring of advanced mass timber structural systems. As well, sensors will be incorporated in the structure to measure building vibrations, moisture levels and vertical settlement as researchers monitor the building’s performance long-term, states Metras. B.C.’s forest industry is also using this as a learning opportunity. A primary objective of the project is to determine the economic feasibility of using mass timber in a high-rise application. A favourable construction could result in long-term positive growth for the industry if wood demand increases. As this is one of the first projects of its kind at this height, additional costs were incurred for design, design review and approval, as well as risk mitigation during construction. Despite these extras, the cost differential compared to a standard concrete building was only eight per cent, says Metras. Several external agencies (Natural Resources Canada, BC Ministry of Forests, Forest Innovation Investment and the Binational Softwood Lumber Council) provided funding to cover the additional costs of this innovative project so the university does not incur a premium to build the facility. As the use of mass timber structure systems in high-rise buildings becomes more commonplace, these cost differences are expected to decline substantially. As the world’s population continues to stretch the earth’s limits and bigger and taller buildings help ensure land-strapped cities can continue to house their residents, the wood-based high-rise will assist in reducing the negative impact on earth. UBC’s Brock Commons will be a strong root in the growth of the construction industry.